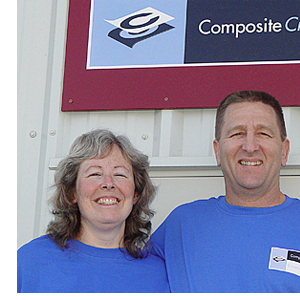 Composite Creations was founded and is managed by Vern and Linda Pifer, a husband wife team that each worked at Lancair for over ten years. Walter Fellows joined the company as an investor in 2009 to provide marketing, engineering and finance from his residence in Seattle. We are located in the Bend Oregon area with a pool of composites production resources at low cost. Vern has an Associate of Science degree in Aviation Maintenance Technology, and he has an Airframe and Powerplant license to work on certified aircraft. His background includes twenty years in the USAF as an aircraft mechanic, with years of management training. Vern has earned 80 Credit hours from Central Oregon Community College in Management training. Vern worked at Lancair for approximately 13 years where he headed the parts department including inventory management, customer service and shipping. Vern also worked on new model aircraft prototype fabrication and building at Lancair. Linda has worked in composite part layup and fabrication for over ten years, working up to Assistant Manager of the Composite shop for Lancair International in Redmond. She has been to school in Reno at the well-known Abaris Composite Training Institute. Linda also taught the composite fabrication portion of the training program for new hires at Cessna. In her later years at Lancair she was chosen to develop the layout and fabrication process for new parts working in tandem with engineering design team. Walter left a 25 year career in commercial and investment banking in 2007 to start a new career in general aviation manufacturing. The finance career included Bankers Trust Company, Barclays Bank and Wasserstein Perella in New York and Hong Kong. His final major assignment in finance was to raise the venture capital financing and aircraft leasing for Cargo 360, Inc. to lease a fleet of B747 freighters to provide air cargo services for Korean Airlines. He acted as interim finance director during the two year period while Cargo 360 was obtaining its Part 121 operating certificate. Walter has a master’s degree in Applied Math as well an MBA from UCLA and a keen interest in aviation, aircraft design and aeronautical engineering. He holds a private pilot certificate with an instrument rating. He is now into his second year of graduate level study of aeronautical engineering at the University of Washington specializing in structures and composites engineering. He has an extensive international background including living and working in Hong Kong, Korea and China for approximately fourteen years. He is fluent in Mandarin Chinese. Corporation was formed in 2005 by Linda and Vern Pifer. Production facility located in Prineville in the Redmond-Bend area of Oregon, an approximately a two and a half-hour drive Southeast of Portland. Aircraft plants in the area include or formerly include the Cessna Columbia plant, EPIC Aircraft and Lancair. Area known for low costs and very friendly business environment. Walter Fellows, who provides engineering, marketing and finance support, is located in Seattle near the University of Washington. Western Washington is rich in resources to support project development including aircraft development, tooling suppliers, engineering talent and design engineers.